It's like a chorus line in my house, all the excited hopeful foods are auditioning for a spot in the fall show. They are singing in the fridge, I can hear them. I'm sorry to say that slow cooker meat sauce did not get a callback, it was only okay. Foods that make the rotation have to perform! I'm eating them almost every day for thirteen weeks, they have to be really healthy first of all if I'm eating that much of them, they have to be really easy to make if I'm making them that much, and they have to really taste good if I'm going to be eating them for thirteen weeks. Not one, but two singular sensations will be starring in breakfasts this fall. I can say two singular sensations if I want. One's for work, and the other's for home; this is the work breakfast, which has to be portable, which means hardboiled eggs in summer and poached eggs in winter, and greek yogurt in spring and fall. Halve and pit the peaches, and arrange the halves cut side up in a 13 x 9 baking pan. My twelve peach halves fit exactly three across and four down in my baking pan. Here's the clever part: thin about a tablespoon of honey with about a tablespoon of hot water in a small bowl. The hot water will melt the honey a bit, then whisk them together with a basting brush. Brush the thinned honey over the cut peach sides, using it all up. This way the honey goes evenly over all the peaches. Lightly drizzle the honeyed peaches with a bit of olive oil, and sprinkle with a bit of salt. 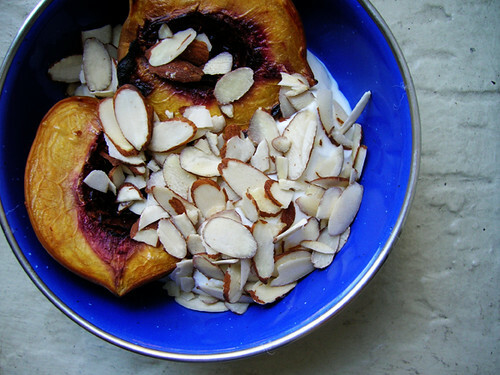 Roast peaches for twenty five minutes, turning the pan around in the oven halfway through if you think of it. Let cool a bit, then plate a couple of still warm halves right away with some greek yogurt and sliced almonds—seriously so good. The rest you can cut up and put away in the fridge, they're also really good cold.